Around the corner from Dalaruan lay Lochead Distillery, beside the site of Parliament Square, where once there was the courtyard to the parliament of James IV mentioned in my last post. This was another distillery name with reference to local history as the old English name for the area around the bay of the loch was Lochhead (sic) at the time it became a Royal Burgh in 1609, a name still in regular use until the mid-19th century (Stirk, 2005). Lochead was another of the distilleries opened in Campbeltown just after licensing was introduced. It was ‘built’ in 1824 as a conversion of an old mill and surrounding houses, and Barnard observes “an air of antiquity…time has indeed dealt leniently with its old stone walls and fences.” It is possible that illicit stills were previously run in some of the houses, benefiting from their location beside the mill. There was a small stream running through the works into the loch, and the Lochead burn that flowed past once powered the old mill. Within Barnard’s short description of the distillery two points stand out. First, he reports that the mash tun is “said to be the largest in Campbeltown” however, unlike most other distilleries, he doesn’t state the actual size. These are generally from 14/15 feet down to 10/12 feet in diameter and from 5/6 feet down to 4 feet in depth for Campbeltown distilleries. Lochead does appear to have a slightly higher washback capacity than the other larger distilleries, yet all this doesn’t transpose into higher capacity through its two regular pot stills. The second point of note are the coolers which he describes as “in the open, and stretch right across the burn.” The detailed NLS map from 1865 shows two worm tubs and one large rectangle on a platform that crosses a lade. The rectangular object may have been a worts cooler of the type mentioned at Springbank and Dalintober and Lochead also had a Morton’s refrigerator. On the opposite bank a few yards upstream we can see on the map the three worm tubs at Dalaruan, one for each still there and decreasing in size accordingly. In 1868 the building of a new church was completed right next door to the distillery, on the grounds of Parliament Square, and the United Free Church moved here from other premises in town. 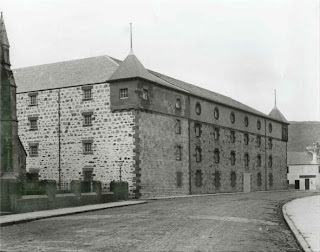 Expansion of the distillery in the late 1890s under new owners included the building of a large new warehouse on the other side of the church which became sandwiched between the two. The front of this warehouse still stands between two tenement blocks but behind is derelict ground. Like many of the distillery buildings that were abandoned after the 1920s collapse in the industry the roof was removed by the owners to avoid paying rates on the property. This practice has inevitable led to the deterioration and subsequent demolition of much of Campbeltown’s distilling heritage, but like all the other distillery buildings that remain in Campbeltown today, in whatever form they now take, this street frontage is now Category B listed. Further expansion just after 1900 saw the construction of a four storey malting facing Kinloch Park in place of the ramshackle buildings that had stood there before. This was a bold structure as can be seen from this early picture, with the front of the church just visible on the left (picture courtesy of Historic Kintyre). ﻿The distillery was bought by Benmore Distilleries Co in 1927 and Lochead ceased production in 1928, the year before they transferred to DCL. I can’t find evidence of what the buildings were used for subsequent to this although a 1971 picture similar to the one above shows the exterior of the maltings largely unchanged. The maltings were eventually demolished to make way for what was first a WM Low supermarket, now owned by Tesco. The church was demolished in 1984 after falling congregation numbers made it unviable and that site is now the supermarket car park; the old Parliament by now a faded memory. The main front of the supermarket incorporates the lower floor of the old maltings as can be seen by comparing the two photos above, the shape of the roof a small nod to the past.